As part of its mandate to accredit current and future tertiary institutions in Grenada, the Grenada National Accreditation Board (GNAB) hosted an Evaluators Training Workshop from 18-20 October 2017, at the Kirani James Athletic Stadium. The GNAB, which began operations in 2014, is making steady progress in the area of accreditation. Tertiary educations must now be registered with and accredited by the board. “You must have external evaluators to do that. Part of the work plan of GNAB is to train external evaluators,” Pauleen Finlay, Executive Director of GNAB explained. 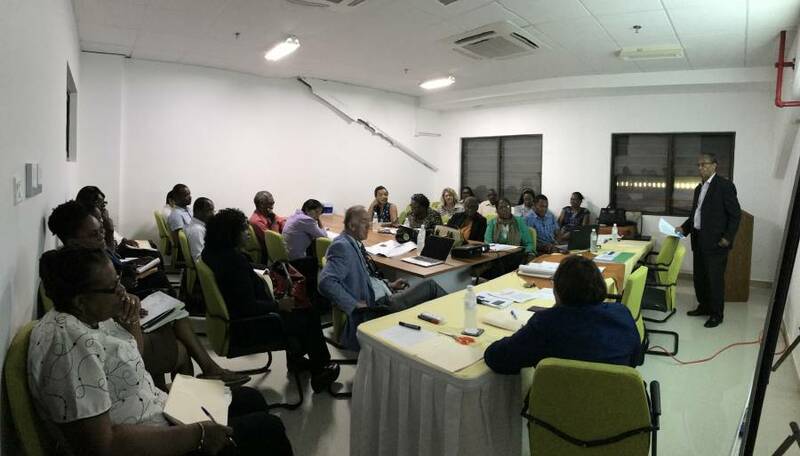 The 3-day workshop’s overall objective was to prepare evaluators, to become part of the team who will perform the evaluative assessment of the islands two main tertiary institutions, the TA Marryshow Community College (TAMCC) and the St George’s University (SGU), later in 2017, with the support of the Accreditation Council of Trinidad and Tobago (ACTT). The workshop focused on 7 key areas including: GNAB as an External Quality Assurance Agency; the legal Authority, the Accreditation ACT; the accomplishments of GNAB; quality assurance and institutional effectiveness; an overview of the policies, principles, guidelines and procedures that have been established for the quality assurance process for institutions in Grenada; assisting institutions in their preparation for the GNAB’s registration process; a review of the registration standards and required documentation; an examination of the GNAB’s expectations for quality assessment and a review of the overall protocol for registration. Facilitators from Trinidad & Tobago, who are versed in the area of accreditation, conducted the evaluators training workshop. They included the very accomplished Professor Compton Bourne and External Evaluator with the Accreditation Council of Trinidad and Tobago (ACCT), Margaret Richardson. Francis, probably the youngest evaluator in training, was recently able to utilise a scholarship to complete his master’s degree, due to the accreditation board’s ability to verify the validity of his first degree. She said the actual accreditation process for both TAMCC and SGU is expected to begin in January, following registration, and last until August 2018.